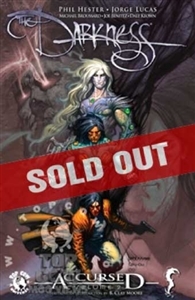 Weakened and battered after a conflict with The Darkness itself, Jackie Estacado flees Sierra Muñoz and heads back to the States. But the road home is no easy journey as he runs afoul of Mexican witches, wannabe gangsters and even Aphrodite IV! Jackie soon discovers his battle with The Darkness cast his soul into Hell while leaving his body and mind on Earth. Enter The Sovereign, an arch-demon who promises to reunite Jackie's body and soul, but at a price that may be worse than Hell itself. Plus, witness a possible future ruled by The Darkness run amok in a spectacular story drawn by a list of all-star artists! Collects The Darkness Vol. 3 #7-10 and the double-sized The Darkness #75 (essentially issue #11 before the Legacy Numbering took effect), plus a cover gallery and behind-the-scenes extras!